What a finale to this past month. The world cup has been controlling my life, detemining when I can make phone calls to Israel (don’t dare while there’s a game! ), when my nanny will make it to work and of course, in what mood, and lastly, what social activities we do over the weekend (must have TV, prefer HD TV). This morning, we dropped off my oldest son at the bus depot as he left for 3 weeks of camp, and rushed to friends that lived nearby to watch the game. 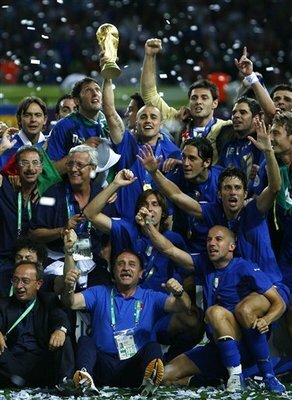 Why am I happy that Italy is the world cup champion? My son Yoav (almonst 9) was cheering for them, for the very important reason that France beat Brazil. That’s just like the saying about your enemy’s enemy being your friend…. Zidane should not have resorted to violence and had to be expelled - a shame to end on such a sour note for a player of his class. However do check the pedigree http://www.youtube.com/watch?v=EpG4AHlZrL4&mode=related&search=matera of your Italian "friend". No one knows what he said or did to Zidane to provoke his reaction - which is so atypical, but it is interesting to witness his track record of improper behavior. Yes, seems like a real sweetheart... I suppose a course in Anger Management might be appropriate. A bientot.